WizKids is giving power gamers what they want. O.P. Arena features a battle royale set at a space station in the center of the galaxy. The goal is simple: Have your Dudes kill the other players’ Dudes. Designed by Robert Burke and Nate Bivins, the game asserts that players have been training their Dudes for years and is now ready to send them into the arena to defeat all comers. With names like Karate Sausage, Lactose Intolerant Unicorn, and Unhappy Cthulhu, it’s clear the tone is tongue-in-cheek. O.P. Arena contains 84 tarot-sized Dude cards, 66 tokens, a scoring track, and dice, damage tokens, and a scoring pad for each player. The game is for 2 – 6 players, ages 14 and up, and plays in 45 minutes. MSRP is $39.99. O.P. 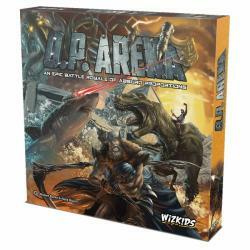 Arena is slated for release in August. Grosnor is a distributor to Canadian retailers only. A password is required to access most areas of this website. Click on Register to open an account. &COPY; Copyright 2013 Grosnor Distribution Inc. / Borduas.net.